This concert is in association with Concerts SA. 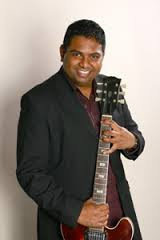 South African guitarist Mageshen Naidoo presents his ensemble on tour through Free State and KwaZulu-Natal, in a series of performances and workshops that will take his indo-African jazz sounds from SASRIM Conference in Bloemfontein to UKZN Centre for Jazz and Popular Music. Mageshen Naidoo hails from Chatsworth in KwaZulu-Natal. He has performed in the USA, London, Scotland, Germany, Sweden, Canada, Mexico, Denmark and the Netherlands. He has recorded locally and internationally. Mageshen Naidoo Ensemble features some of the country’s best jazz luminaries. The KZN concerts will feature Mike Rossi (saxophones), Neil Gonsalves (piano), Ildo Nanja (bass) and Sidney Rash (drums) and Mageshen himself on guitar. Mageshen Naidoo’s tour is supported by the Music Mobility Fund, a funding mechanism administered by Concerts SA which offers opportunities for South African musicians to undertake live music tours. Join Mageshen Naidoo Ensemble at The Centre for Jazz and Popular Music (CJPM), Level 2, Shepstone Building at UKZN Howard College Campus on September 28 at 18h00. Doors open at 17h30. General admission R60 (R40 pensioners, R20 students). Contact Thuli on 031 260 3385 or email Zamat1@ukzn.ac.za for more details.